Den Haag is a wonderfully creative city, with plenty of things to sketch and artists to sketch them. 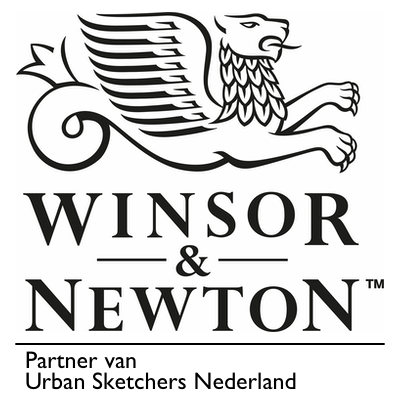 So why not have our own local Urban Sketchers group? I put this question to my fellow sketchers on Saturday as we walked towards the Marthal in Rotterdam. To my surprise, there seemed to be just as much interest among our Belgian visitors as there was along the locals. It seems that sketchers love to travel as much as they love to draw! Encouraged by their responses, on Monday morning I created a Facebook page and a Twitter account for a brand new urban sketchers group in Den Haag. Very soon there was a show of interest, with artists Ceara Lg, Daragh Walsh, and John Henniger posting sketches they had already done in Den Haag. (See their sketches below.) We even gained the attention of the Düsseldorf / Köln, prompting Ruud Otten to create a new European Urban Sketchers facebook group. After some deliberation, we decided that our first-ever Den Haag SketchCrawl will be on Sunday 1 May. At 13:00 we’ll meet at the Paviljoen Malieveld, near Den Haag Centraal. From there we can sketch a nice range of scenes, including the Den Haag skyline, the koecamp, paviljoen, and the Prinsessegracht. And since half the point of these meetings is to socialize, at 16:00 we’ll re-convene in the Paviljoen Malieveld to have a drink, chat, eat poffertjes, and share our work. Needless to say, everyone is welcome! There are plenty of great locations we could sketch in the future, too. Den Haag boasts a wonderful mix of landscapes: classic canals, modern city, industrial lefovers, parks, and beaches. And in the mids of all that there are lots of people bustling to-and-fro. Even the animals in the koecamp are part of the urban landscape! Boat tour on a canal – sketch while in motion! Who would like to help organize our group? If we have a few organizers, then we can hold more events and do more blogging about our art. More heads also means more great ideas. Also, my Dutch is pretty limited, and it would be helpful to have a volunteer to make announcements in Dutch. If you’re interested in taking on an organizing role, I suggest we meet an hour before the next sketchcrawl starts, at 12:00 midday on 1 May in the Paviljoen Malieveld. I'm going to move back to The Netherlands/The Hague in 3 months. Can't wait to be part of the Urban Sketch Group! Karen you will be most welcome!